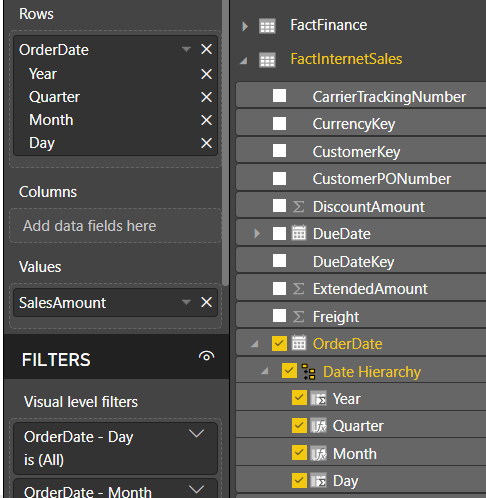 Welcome back to day nineteen of our thirty-day series on Success in Power BI! Have you forgotten where we left off from day eighteen? If so, here is the link to refresh your memory. 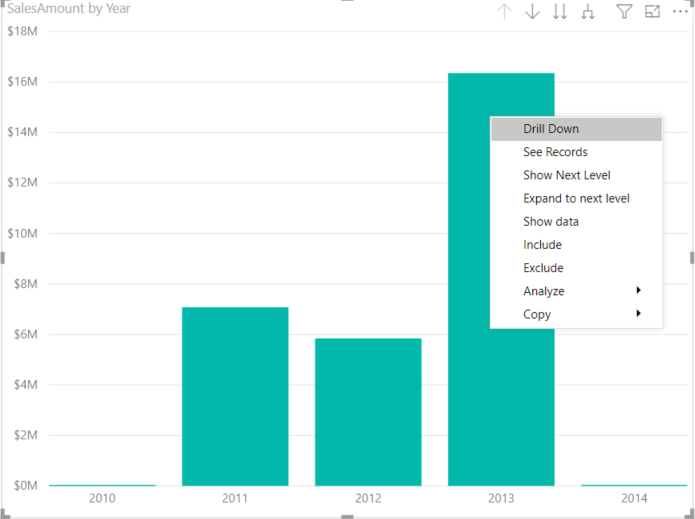 For the next few blog posts we are going to discuss taking Power BI to another level. We are going to discuss drill down (or up) and drillthrough. Let’s explain the terminology first! With drill down, we can go from a high level on a report like Year to Date Sales to the lowest detail that we wish to show. We can decide how many levels of drilling. 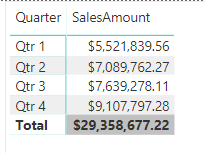 So let’s say our first level is corporate-wide so we might see one row for 2017 that has sales data totals for the entire corporation. 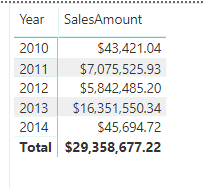 If we drill down to the next level, we can see that inside the corporation we now have totals by global regions. If we drill down a little further we might see totals by country and then totals by smaller regions and so on. Drilling up is simply going back up that chain. 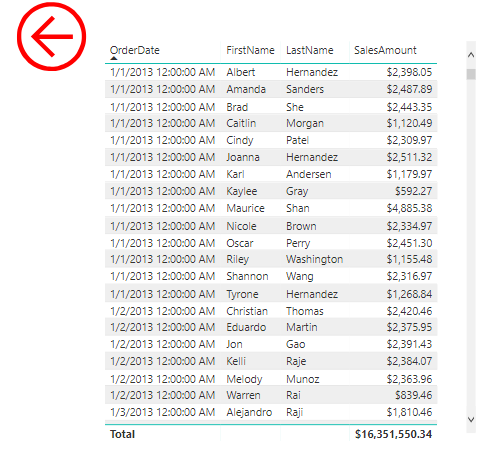 This adds an entirely new dimension to our reports that eliminates the need for multiple static reports. 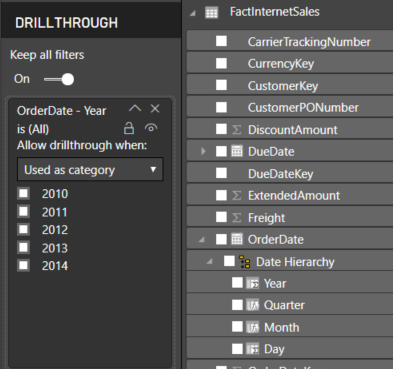 Drillthrough, on the other hand, provides the ability to drill through to another page or report for detail and thus filter by the field that you selected when you chose drillthrough. 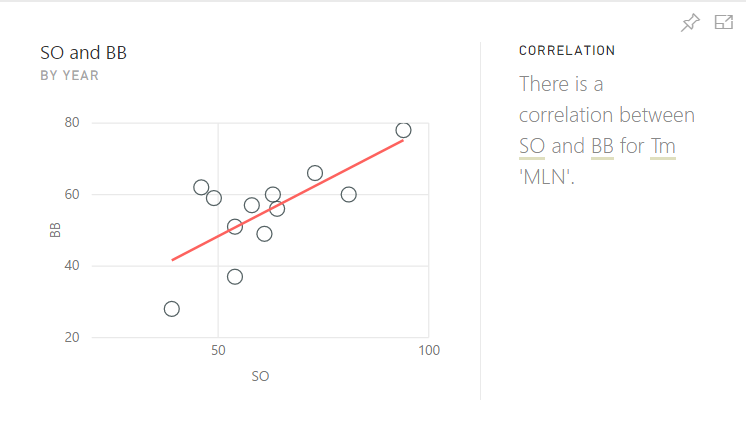 For example, when we have our drill down and we get to the country detail on our report mentioned above, we could drillthrough to a second report that shows sales details and it would then filter by that country. If this sounds a little confusing, do not fret…we will go through it in the next couple of posts. Stay Tuned! 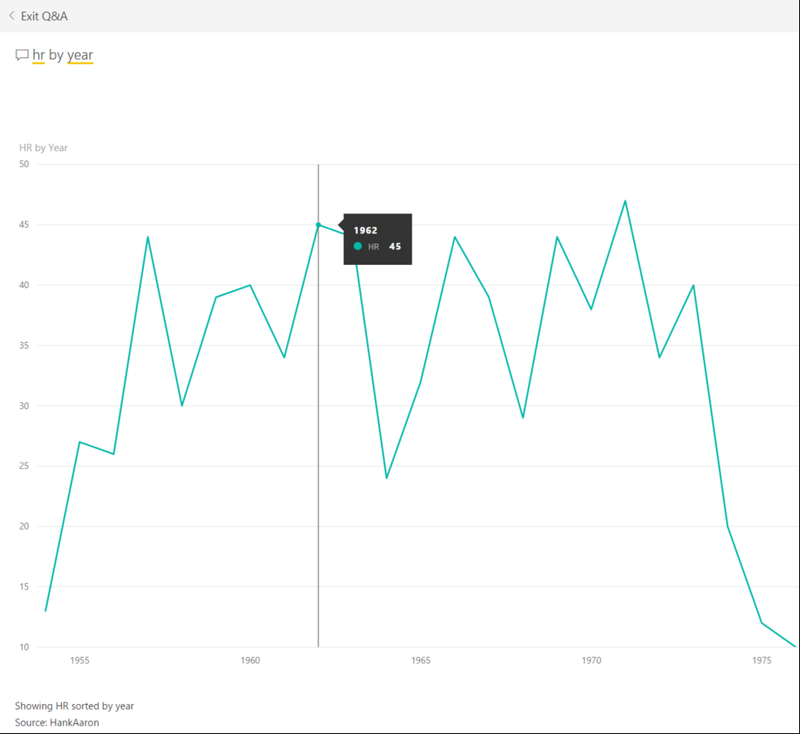 Welcome back to day eighteen of our thirty-day series on Success in Power BI! 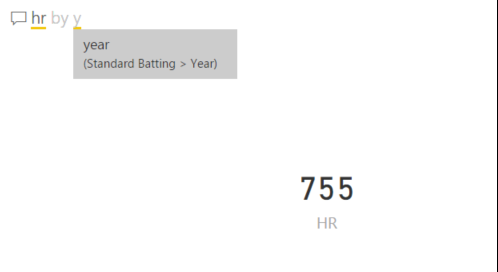 Have you forgotten where we left off from day seventeen? If so, here is the link to refresh your memory. 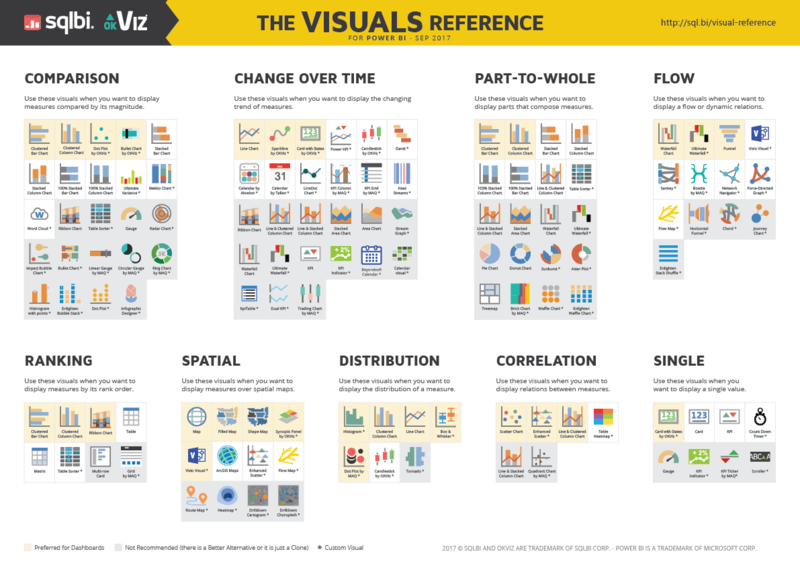 The page where the image was found (http://www.sqlbi.com/ref/power-bi-visuals-reference/) has a download option for the PDF for your daily use. Enjoy! 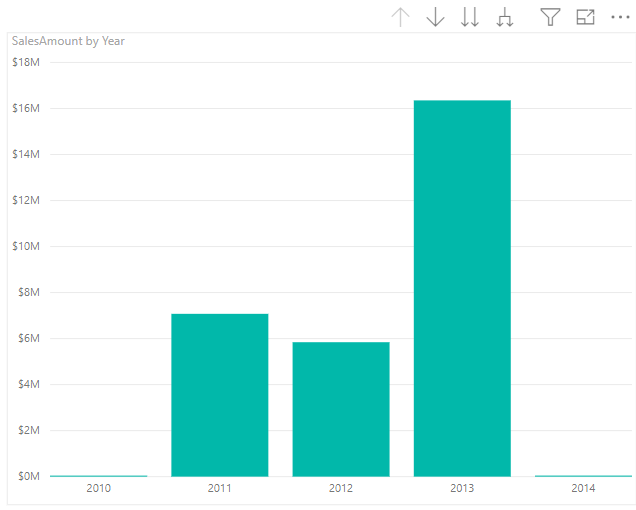 Welcome back to day seventeen of our thirty-day series on Success in Power BI! Have you forgotten where we left off from day sixteen? If so, here is the link to refresh your memory. 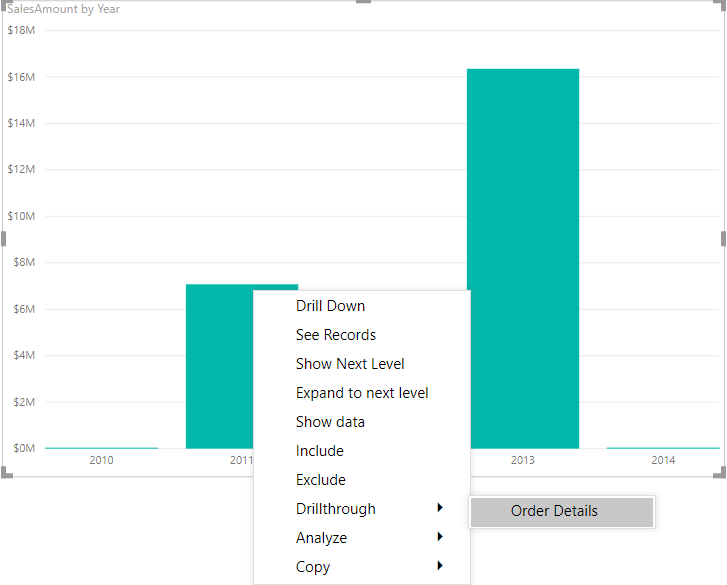 Now that we have some insights loaded into our dashboard on PowerBI.com, we can use the Q&A feature of Power BI. What is Q&A? 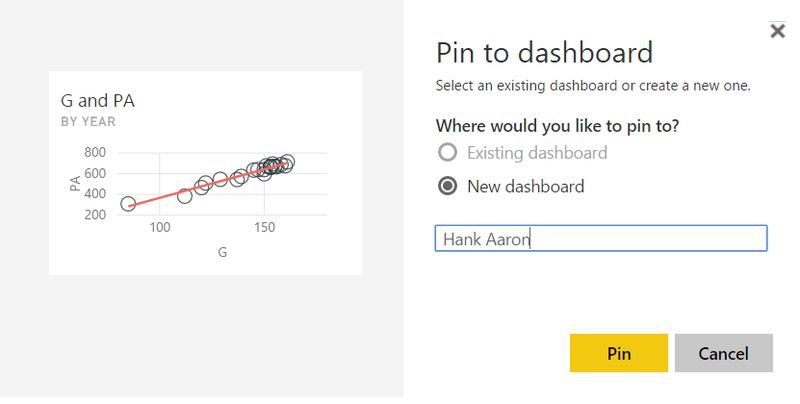 It is just what you think it would be: question and answer, only this time your Power BI dashboard end-user asks the question of your data and the software returns an answer!!!! This sounds like some straight-up Skynet Terminators taking over the world science fiction, right? Well, of course, we are data people so now WE HAVE THE ULTIMATE COSMIC POWER!!! OK, maybe not that cool, but still! Let’s dive in and take a look! 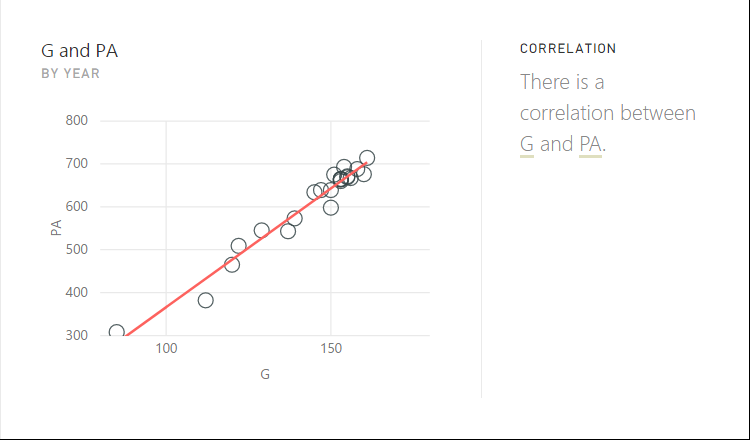 In Figure 1, we see our original dashboard and if you look right above the pinned insight “G and PA” you can see the “Ask a question about your data” field area where we can begin typing. 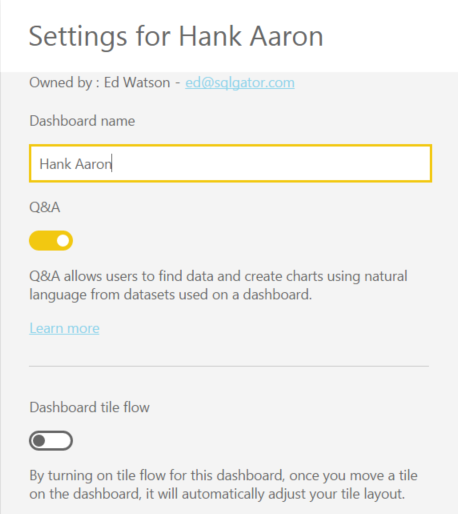 Once you click into this field it will show you a different screen without the pinned visualizations and will show you some sample columns to select or you can begin typing your question. 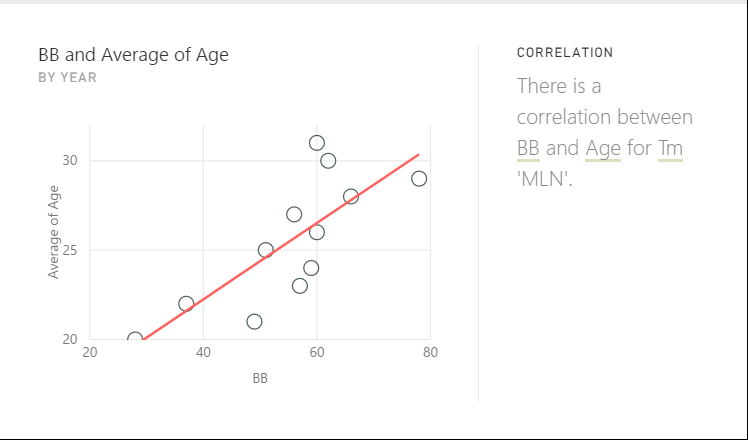 In essence, Q&A provides answers in the form of charts and graphs to natural language questions in real-time type-ahead fashion. 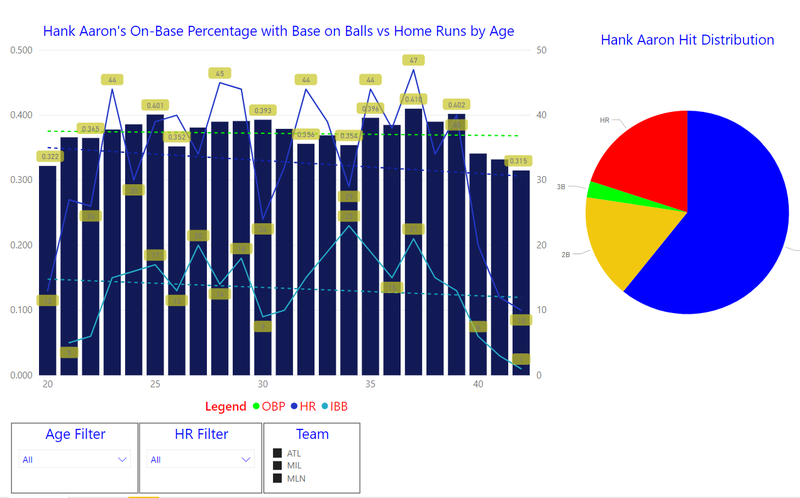 Watch the progression in Figures 2 through 5 as we type ‘hr by year’ as our question. 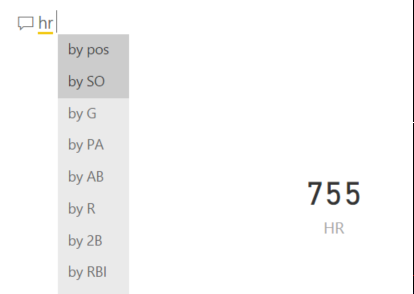 Also, notice that typing HR first gives us a 755 HR total in the chart responding to our request. 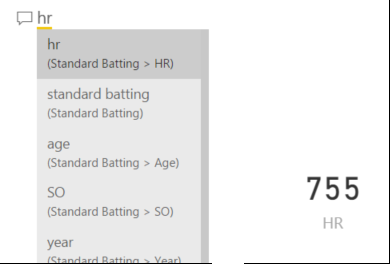 Remember that our dataset is called Standard Batting so you can see that Figure 2 shows us the HR column of that dataset as a selection. 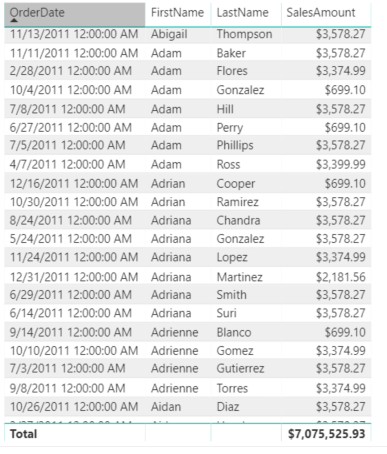 This is useful if the column was found in multiple locations. 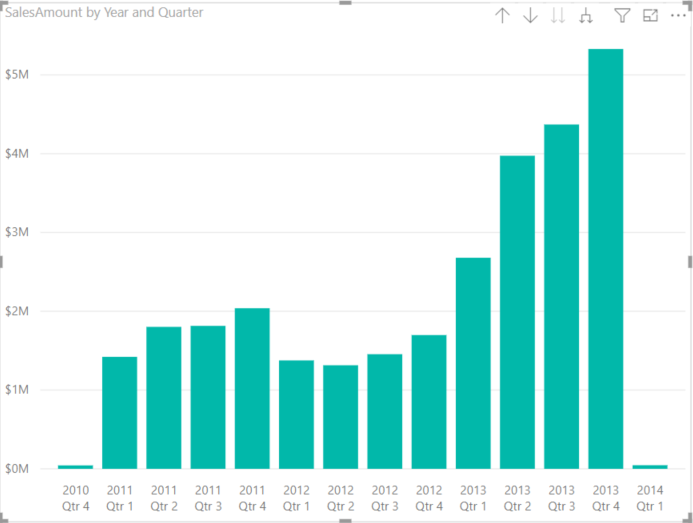 We’ve now successfully utilized the Q&A feature of PowerBI.com. 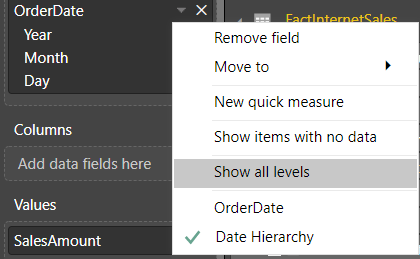 If you did not see that feature, make sure that you have it turned on as shown in Figure 6 below. Stay tuned for the next day in this series!